A few more web-based tools for your delectation. Adobe Buzzword - I'm currently working on a series of LARP scenarios with this at the moment; it's very pretty and offers the usual document editing and support. My only caveats are you are tied to the interface and it's also not the fastest system to upload shared files. Once you get the file up though, it's a very intuitive package. BambooSpace - Creating a wall of stuff has never been easier. Ready made game master screen? You can make one right here and set it up for the game. You might even want to share it with the other game masters in your network. Or you could set up something else like a working desk with inspirational stuff. Exploratree - A Flash-based site which gives a number of templates for thinking about ideas. Wonderful not least for it's online selection of thinking guides but also the templates as well as well as being able to share all of the above or print it out up to A0 size (this should meet most requirements!) . Has it's own section for the Welsh as well. Lefora - Easy to set up (easier than you'd think) online forum. Laden with features and can draw on existing content from YouTube, Flickr and Photobucket. There are polls, spam filters and MediaWrap facilities to port your forum posts out to other sites as well. It's reasonably priced (free) and there's no hosting hassle either. MorphThing - Pictures of characters. No really, you can lose a whole day doing this though if you've chosen someone with facial hair and someone without, it can get a bit jarring seeing five-o-clock shadow on a woman's face. 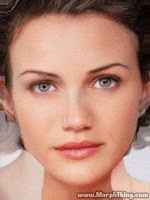 Plays best with faces facing the same way - eminently exportable to graphic applications, the picture opposite is Cameron Diaz and Carla Gugino. PDFEscape - Online PDF reader/writer/form designer. You can save online forms to printable PDF forms; there is a 30 day lifecycle on forms left on the PDFEscape server but you can upload your own versions onto other sites like this example - a version of the character worksheet from the emotional easter eggs post. Planypus - Organise meetups, events using a wiki tailored to your requirements; lets you set up events, discuss and vote on them before setting things up. This approach allows you to set up a regular long-term event and would work well in conjunction with services like Obsidian Portal or one of the previously mentioned online wikis.